Feeding skin from the inside turbocharges the effects of topical skincare creams and facial treatments. 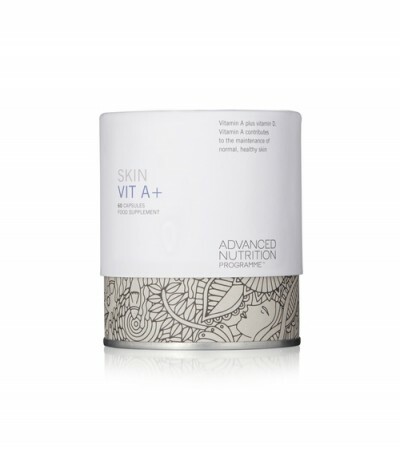 The Advanced Nutrition Programme™ is a very high quality range of supplements, manufactured specifically to support and maintain healthy, glowing skin. Award-winning Skin Accumax completely transforms the behaviour of problematic skin. The key ingredient is DIM, sourced from brocoli and patented so isn't found in any other supplement. DIM, combined with vitamins A, C & E and an active phyto-nutrient component,encourage normal cell function to clear up redness, breakouts and uneven texture. Start with 4 capsules a day with meals, reducing to two capsules once your skin starts to improve. We advise taking for a minimum of 14 weeks but you can safely take for longer. Discontinue once you’re happy with the results. Do not take if pregnant, planning pregnancy, breastfeeding or taking prescription medication containing retinoic acid or tretinoin. If in doubt, please consult your GP. dairy, yeast, artificial colourings or flavourings, wheat or gluten. Suitable for vegetarians and vegans. A combo of two premium supplements (Skin Vit A+ which is enriched with vitamin D, and Skin Antioxidants) for healthy skin. They work in synergy to protect skin from the inside and to reinforce all the good work your topical vitamin A cream is doing on the outside! Builds healthy skin cells • stimulates cell renewal • increases protection against environmental attack • plumps the epidermis • stimulates blood circulation • balances sebaceous glands • stimulates collagen and glycosaminoglycans • reduces melanin production that can cause pigmentation. Check with your GP if taking anti-coagulant medication such as heparin, warfarin, coumadin. Contains fish oils. They hold a Friend of the Sea certificate, ensuring the omega 3 is sourced using methods that conserve marine habitats. Vitamin A is suitable for all skin types and is the most important vitamin for cell renewal and normal, healthy skin. Take one capsule a day with a meal. Do not take if pregnant or taking fenfluramine or anti-depressants. It can cause drowsiness.